There are 35 Assisted Living Facilities in the Ellisville area, with 4 in Ellisville and 31 nearby. The average cost of assisted living in Ellisville is $2,920 per month. This is lower than the national median of $3,346. To help you with your search, browse the 186 reviews below for assisted living facilities in Ellisville. On average, consumers rate assisted living in Ellisville 4.4 out of 5 stars. Better rated regions include Ballwin with an average rating of 4.4 out of 5 stars. Caring.com has helped thousands of families find high-quality senior care. To speak with one of our Family Advisors about assisted living options and costs in Ellisville, call (855) 863-8283. Ellisville has been recognized by the National Arbor Day Foundation as "Tree City USA" for 31 consecutive years, and it has over 230 acres of parkland, which makes it a good option for seniors who enjoy outdoor activities. Seniors make up the fourth-largest demographic group in this city, accounting for roughly 20 percent of the city's 10,000-person population. There are 31 assisted living options for local seniors to choose from, including four within the Ellisville city limits. In Ellisville, as in all of Missouri, assisted living facilities may also be called assisted living residences or personal care homes, and they accommodate those who need assistance with the activities of daily living. 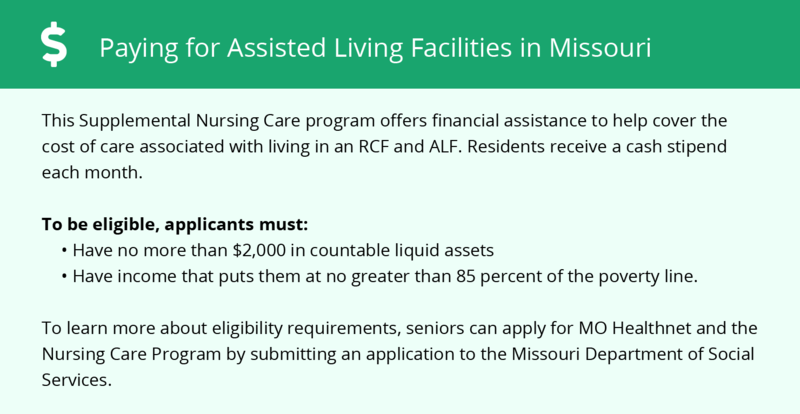 Assisted living facilities in Missouri are licensed by the Department of Aging. Ellisville's air quality is subpar, which may affect the quality of life of seniors with respiratory conditions like asthma and COPD. According to the American Lung Association, St. Louis County's ozone pollution levels are high, with the county receiving an F for this type of pollution. The region's short-term particle pollution levels are moderate, receiving a C.
Ellisville's cost of living is roughly 20 percent higher than state and national averages, primarily due to the city's high cost of housing. However, seniors may expect to spend a little less on groceries, utilities and healthcare expenses than they would elsewhere in the nation, which may offset mortgage and rent costs. Ellisville has hot, muggy summers and cold winters. July, the warmest month of the year, has highs near 90 and lows around 70. January, the chilliest month of the year, has highs in the low-40s and lows in the 20s. This may be a consideration for seniors who enjoy participating in outdoor activities throughout the year. Ellisville is rated to be safer than 50 percent of U.S. cities of all sizes and 58 percent of Missouri cities of all sizes. When compared to similarly sized cities, Ellisville's crime rate is considerably lower than average, which may provide peace of mind for seniors who are retiring to the area. While Ellisville seniors pay state income tax on all retirement income, they may claim deductions on their Social Security benefits and public pensions. The state's sales tax rate is higher than average, but property taxes are relatively low. Ellisville has no facilities from which to choose in the event of a medical emergency or illness, with the nearest major hospital located in Ballwin. Assisted Living costs in Ellisville start around $2,920 per month on average, while the nationwide average cost of assisted living is $4,000 per month, according to the latest figures from Genworth’s Cost of Care Survey. It’s important to note that assisted living rates in Ellisville and the surrounding suburbs can vary widely based on factors such as location, the level of care needed, apartment size and the types of amenities offered at each community. 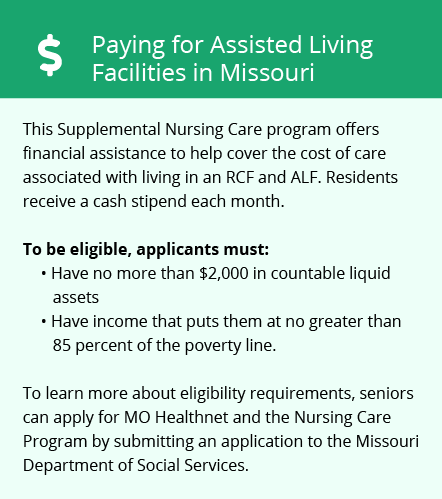 Low-income seniors in Ellisville may have personal care services received in an assisted living facility covered by the Medicaid State Plan Personal Care program. Ellisville and the surrounding area are home to numerous government agencies and non-profit organizations offering help for seniors searching for or currently residing in an assisted living community. These organizations can also provide assistance in a number of other eldercare services such as geriatric care management, elder law advice, estate planning, finding home care and health and wellness programs. To see a list of free assisted living resources in Ellisville, please visit our Assisted Living in Missouri page. Ellisville-area assisted living communities must adhere to the comprehensive set of state laws and regulations that all assisted living communities in Missouri are required to follow. Visit our Assisted Living in Missouri page for more information about these laws.